Molly Sweeney can identify several varieties of flowers from the scent and touch. She is a championship swimmer who elegantly describes how slicing through the water, of a pool or the Atlantic Ocean, makes her feel. She came out first in the physiotherapy course that led to her career as a massage therapist at a Donegal health club. Molly Sweeney is blind. And contentedly, independently so. In addition to the listed achievements, she can and cycle unaided through the Donegal countryside. On the night before an operation to restore her sight, always there biologically but occluded since birth by several diseases, Molly does a wild, emotional hornpipe, stepping and skittering throughout a party in her home without, she says, brushing against one shoulder or touching a piece of furniture. Not so much as making a glass or bottle fall. Molly has never had a desire to see, but when it loomed as a possibility after 41 years of sightlessness, she agreed to try, “Who wouldn’t?” would be a common question. What would she have to lose? She can’t get blinder. Think of the miracle. And the new world that will open when color and visual definition are added to Molly’s obviously keen perception! Alas, Brian Friel’s “Molly Sweeney” is a tragedy. Based, if I remember correctly on a case chronicled by that brilliant explainer of the mind’s intricacies, Oliver Sacks, Friel shows how the advent of vision, limited vision as it turns out, doesn’t expand Molly’s world but limits it and makes it frightening. Molly is totally adept the world she created. The new information, transmitted through her eye, is disorienting and disturbing, It’s a factor that skews rather than adds to her ability to function. As poetically revealed by Friel in a series of monologues from Molly, her husband, Frank Constantine Sweeney, and the doctor who performs her clinically successful surgery, Molly becomes lost, after a brief period of excitement and exhilaration, in situations for which she has no learned sensual vocabulary. Besides sensations and imagining of shapes and entities being present when they’re not, Molly is also introduced to vanity, a new judgment of beauty that affects even her love for flowers, and worst of all, an environment that makes no spatial sense. Part of this, Friel suggests, might come from the analysis that Molly had to endure following her surgery, the psychological, sociological, and journalistic community claiming their piece of the pie. She was helped, perhaps well-meaningly, to adjust to sight rather than integrating what she knew with what she was experiencing after four decades of happy survival. For instance, the mental health-social work folks, along with Molly’s husband and doctor, want Molly to tell a flower by sight and resist going to her handier methods of identifying it. As too often happens in life, no one allows the “and” when it’s better than the “or.” Molly may have fared better with sight if she was permitted to fit it in among her senses instead of being badgered to be like sighted people and make it the dominant sense in given cases. Friel is a marvel at bringing out all of the ramifications of the step Molly is to undertake. He has both Frank and the doctor speak about the scientific and psychological aspects of trying to restore sight. There is an explanation and discussion of engrams that might sound dense as I write it about but is really quite enlightening. “Fascinating,” as Frank may say. Friel’s use of monologue in “Molly Sweeney” works more felicitously than it does in another similarly constructed play of his, “Faith Healer, and is accepted as the mode of exposition even when you wish the characters could interact and that you could see some of the scenes between Frank and Molly in particular rather than hearing their individual, and usually corroborating, reports of them. “Molly Sweeney” is about so much more than its plot. Friel is one of the great playwrights of the late 20th century, and he endows his piece with wide-ranging themes that resonate beyond the example of Molly and her adding sight to her life in middle age. Friel makes you think of letting well enough alone, of the influences others have on us, of buying into what might generally be considered a better condition when that isn’t necessarily soon, and how one person’s agenda may drive them to ask others to take risks or change for his or her aggrandizement rather than for the benefit of the person purportedly being helped. “Molly Sweeney” has long been my favorite of Friel’s work because of how fully and artfully he includes so many ideas to think about beyond the obvious one at hand. 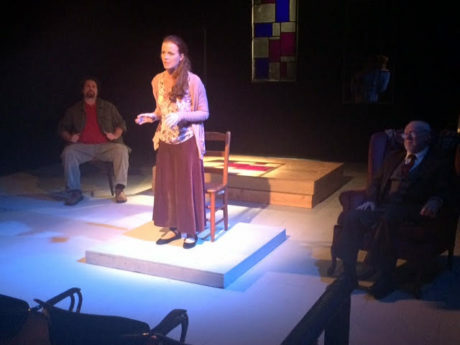 Peg Mecham and her cast at Irish Heritage Theatre miss no beats, not one, in presenting Friel’s play with all of its inherent surface interest brimming to a boil while the equally innate tragic possibilities loom, and all themes come through clearly and with poignancy. Mecham’s is a lovely rendition of “Molly Sweeney.” Kirsten Quinn, Michael Toner, and Ethan Lipkin may never interact, although each occasionally assumes a pose or gives a look that responds to something another might be saying, but they weave an all-encompassing tale and do so in a way that piques your interest and stirs you emotion. Kirsten Quinn deserves more roles like Molly. In this role, as she did with Juno Boyle in an earlier Irish Heritage production, Quinn conveys all of the facets of her character. It’s buoying to see her expose Molly’s confidence or go into that hornpipe that might well be Molly’s final hurrah. What makes Quinn’s performance special is how she foreshadows the tragedy, the thoughts and fears that defeat Molly before they materialize. Quinn physicalizes tragedy. In her shoulders, in her hips, and in her face. She expresses fear before Molly is aware of how profound it is, and this is right. It is not indicating or giving something away. It’s letting an audience know be a little ahead of the script or the character by subtly showing that all is not as all right as it appears or as Molly’s words are expressing. A thoughtful, lively performance goes to a new level. You would feel bad about the ebullient, confident, self-sufficient, undeprived Molly losing the compass that brought her such happiness, but Quinn makes the loss more hurtful, more devastating by retaining signs of Molly’s resilient spirit and good nature while conveying how completely both are being undermined and defeated. You have hope Molly might rally when you know, when Quinn shows you, she is irreversibly shriveling. Quinn’s subtlety and gentle but telling changes in tone contrast markedly with the boisterous performance Ethan Lipkin so marvelously gives as Frank. Frank is a serial enthusiast. Everything he turns his hand to fails. But Frank lets bygone fiascoes be bygone and goes forward to be fascinated by some other idea, notion, or undertaking that he must pursue to the nth degree squared. He is a living algorithm of effusive excitement. Molly’s blindness follows goat herding, beekeeping, and humanitarian work in Nigeria while preceding taking food to Ethiopia/Abyssinia among efforts Frank goes about with unbridled, overweening zeal. It is Frank who first broaches the idea of Molly, who can see light, the direction from which light comes, and Frank;s hand passing in front of her eyes, attempting the operation to restore her vision. Lipkin is amazing in the way he bombards, nay assaults, the audience with information. He treats we assembled at the Walnut 5 as if we were his mates sharing pints in a Donegal pub, even eliciting responses to the many questions Friel gives Frank to ask. Members of the audience in which I was a part, took the time to answer. Lipkin lets you see the engaging, infectious side of Frank while reminding you of Franklin and Shaw telling us a little knowledge is a dangerous thing and that being a little acquainted with a subject can be more harmful than knowing nothing about it. Lipkin is hail-fellow, well-met and keeps a smug, curious, self-satisfied expression for most of the first act, even when others are speaking. (Quinn also does marvels while she is silent. Her eyes stop their gaze at the tip of her nose. Yet you can see her thinking and cogitating and considering all that is going on around her.) For all of his enthusiasm and bravado, you see the temporary side of Frank, how one fascination, including Molly, will be replaced by another and how he considers himself an expert when he’s barely an amateur researcher. Molly’s doctor, Mr. Rice, calls Frank an autodidact who never has his ideas challenged. As “Molly Sweeney” proceeds, you fall more in line with Rice’s assessment and fear for its consequences. Michael Toner keenly brings out all that motivates Doctor Rice. He, at age 32, was one of the four horsemen of the international ophthalmological community, and Irish genius among prestigious German, Japanese, and American colleagues. At age 32, Rice experiences a personal trauma that becomes a professional nightmare. He harps on it throughout his recitations. But unused and unasked for as it might be, Rice’s talent remains. He may be at a dinky hospital in Donegal, but he has the skill and medical perspicacity to be at Columbia Presbyterian or Johns Hopkins. Rice is superior man in a reduced setting, He has never quite been able to rejoin the ranks of the ophthalmology elite. Toner plays that pride and that difference in Rice vividly. He lets you see as well as hear how much the attempt, let alone the success, of giving vision to Molly Sweeney means to him. The idea he can recapture his grandeur sways him. He may buy into Frank’s research about Molly’s condition. He may be more aware of the negative that could occur to Molly, because of how she developed her engrams, if she could see. He may think it’s folly to subject a contented woman to something that might be confusing. But the German, the Japanese, and the American, especially the American who won Rice’s wife from it, will have another word to say if Rice can, for the 21st time in ten thousand years of recorded history, give Molly Sweeney even a semblance of sight. Frank and Mr. Rice create stakes without sensitively calculating Molly’s. Rice knows Molly might be inundated with images and perceptions that go beyond her being able to bear them. But he proceeds. Not for Molly. For Rice. Molly proceeds. Not for Molly, but for Frank. Rice’s line at the first act curtain, one even I will refrain from revealing, causes a chill, and Michael Toner, with his delivery of the line, makes that chill, that tinge of doubt, that idea a happy ending is improbably, especially thought-provoking. Kudos also to Eric Baker for his lighting and Teddy Moseanu for his simple but tension-enhancing set. This entry was posted on October 13, 2016 by nzoren in Theater Reviews and tagged Brian Friel, Ethan Lipkin, Irish Heritage Theatre, Irish Theatre, Kirsten Quinn, Michael Toner, Molly Sweeney, Oliver Sacks, Peg Mecham, Walnut 5.